Here is a wedding cake we designed last week that has definitely found a spot in our category of favorite ever wedding cake designs. It’s our rendition of what’s popular in the wedding world right now, dusty rose, fabric and lace ruffles, broach flowers and anything vintage! 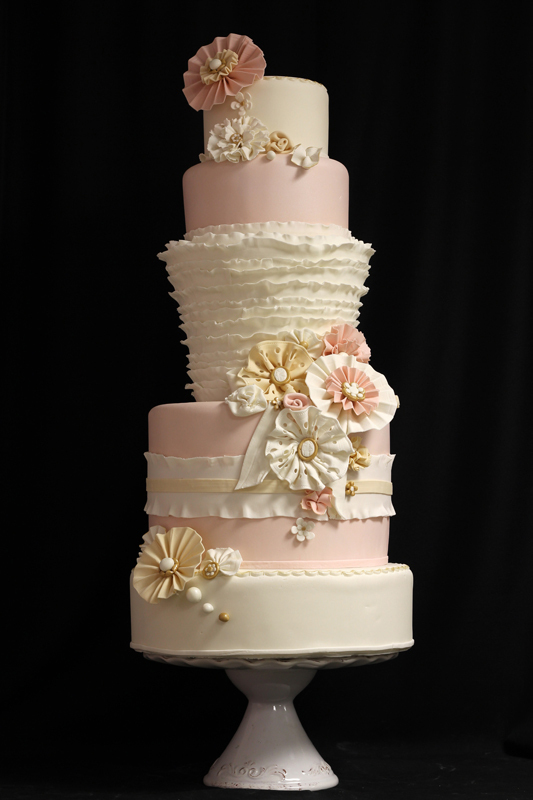 This cake is fairly large standing 3 feet tall (including the stand) but we’d be happy to adjust the height and design for anyone wanting something similar for their special day. This cake is beyond amazing!!! You do such outstanding work! If you don’t mind me asking did you use a veiner/mold for the flowers? no molds 🙂 The flowers are handmade by folding gumpaste. I just wanted to congratulate you on such a fabulous design. The flowers are just AMAZING!!!!! Great job! If I had to get married again, I would LOOOOOVE a cake like this!! Wow!!! !